One of the things I like about watching facebook and twitter statuses is how conversations seem to occasionally overlap. At the risk of looking like a chat-and-tell blogger, I offer you another brief chat transcript. In this case, a friend told me that his last blert shirt recently reached the threadbare stage. A few friends from way back decided to get a big batch of these shirts to promote a really cool magazine they were planning. 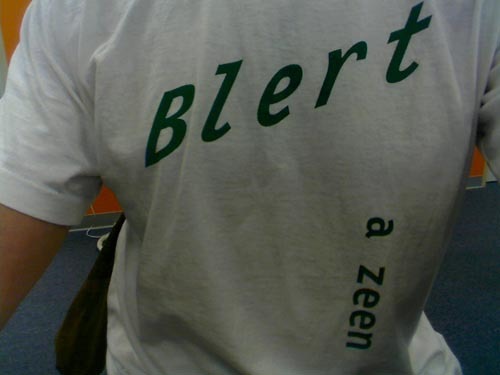 The shirts proudly declare, "blert a zeen." The magazine didn't stick around too long, the band resurrected the name for a while, but these shirts have made their way all around my circle of friends and family. I passed kudos back to the graphic designer who designed the shirt and was half of the genius duo behind this early incarnation of the blert lifestyle. CG: welp, I just wanted to pass that tidbit along in case your ears were ringing a few days back. about the blert shirts. JM: i don't think they were. do you need the artwork? CG: well that's your design, right? yeah. CG: So it's a classic by now... 15 years on or something? still relevant. people are still talking about it. CG: lol. well if you dig something up, ping me, transfer and I'll put it up on cafepress. JM: it's a classic design. actually, it doesn't feel dated. except a zeen is kinda an irrelevant concept now. CG: I'll do it too and snap a pic. Maybe I should toss these into my last post about the get-together. Just a few mire words on this before I return to posts about vertical ad networks, qa and the like. I didn't really make it to 29 songs as planned, but I'm ok with it. I have at least 10 (ok, maybe 6) decent songs to refine which is way more than what I had at the start of the month. I uploaded a bunch of tunes from the wrap party to the 29 site (finally). I have stereo versions of the full band experience. Email me if you're desperate to hear those recordings (then please turn yourself in to the kookoo police). make it easy to embed all of these into other internets. So what's next? I'll be spending some make-up time with the fam (and work) in the meantime. I also need to rehab my leg which was bonked one recent Saturday when I should have been finishing some songs. After that? I learned that I like recording tunes and I need to keep rolling with this. I learned that my main blockage with songwriting is more in the commitment department than the execution (except maybe the verboligization that accompanies the rock guitar). Even if it's just a slow simmer of experimentation, I need music to be happening. Maybe some 29'ers will get together to jam. Maybe we'll get to collaborate in each others studio to help get Greenberg's recordings recordings LOUDER... I DEFINITELY need to thaw out and finish a few blert songs that haven't been heard by many. Maybe I need to launch http://52.netscrap.com to be home of our new song-a-week lifestyle. Back in the old days, when I was motivated, somewhat creative, and had gobs of freetime I decided I'd challenge myself by writing and recording a song every day for a month. I chose February, the shortest month because I'm not an overachiever. I want to try it again this year. Clicking around the net, it turns out that my '29 songs in February' idea isn't too original. The RPM challenge is slightly different in that it's more about delivering a full album at the end of the month. Sure I did this back in 1996 (or was it '95?). The one thing that pleases me is learning that there's something universally musicianly about choosing the shortest month in the year for this kind of effort. write and record 1 (or more) song(s) every day for a month. fragments, grooves, hooks, choruses... it's all good. Just record it. starting early, ending late.... it's all good. Let your guilt be your guide. taking 2 days to finish recording a song... great. Just end up with 29 at the end of the month. ending up with 28 songs at the end of the month... great. Just end up with as many as you can. They don't necessarily have to be good. You might not know they're good until a few months later. This seems like an unlikely time to get involved with an activity like this: blert is in deep hibernation, Little john is buried, we're up to eyeballs in work and family. it's good practice to let go. good enough is ok, move on. because then you have 11 months to revise, refine, and record a pile of work (and think like a producer). it's good practice of your engineering skills: get your workflow in shape. does this really need more elaboration? A few folks are interested in taking this trek. We'll collect everything somewhere online and share the best of the bestest. Drop a note if you're interested in doing this too or if you're mucking with the rpm challenge. Little John or blert played a show at the Stork Club a while back with a trio called Oh My God. They blew everyone in the room away with energy and fuzz. I joined their mailing list and kept an eye on their flirtations with mtv, incredibly hectic touring schedule, and growing buzz. All four of us have been engaged in regular physical therapy and are trying to get our bodies back together. It's been a long, cold, difficult fall and winter, staying at home (and, in Matt's case, in Oklahoma for months with his parents) and not playing music and out of contact with everyone. We'll just have to see how this goes for each of us and let you know about any future prospects. Got to get these hands and legs in better shape before any talk of carrying stuff and playing instruments. In the meantime, I edited together some footage from some of the last shows we did before the accident. We had conceived a series of "webisodes" to post on our site--sort of travelogues with a title inspired by Billy's hand-made "Legalize..." t-shirts. The show is called "Legalize oh my god" and parts 1 & 2 of the first episode are now posted at www.ohmygodmusic.com and on YouTube (search Legalize oh my god). Go watch it (it's under the "L.O.M.G. banner" on our site) and register your vote and comments, please. I think you'll dig this. Endless thanks to the thousands of emails, texts, etc. we've gotten since the crash. Thank you to Breaking Laces, La Cacahouette and the other bands and people who put on the NY-state oh my god benefit shows. Lastly, our good Chicago friends the Detholz started the website www.saveohmygod.com. Please go to it, spread it around and do what you can. Also, we sure had ordered a lot of Fools Want Noise and oh my god T-shirts before this cancelled tour. If you'd like to take 'em off our hands, go to the webstore at www.ohmygodmusic.com. And the CD Fools Want Noise remains available at www.splitredrecords.com. Send them warm fuzzies. Or money: stories of musicians with broken hands really bug me.